The new Matmos EP, ‘The Ganzfeld’ comes out in October on Thrill Jockey. 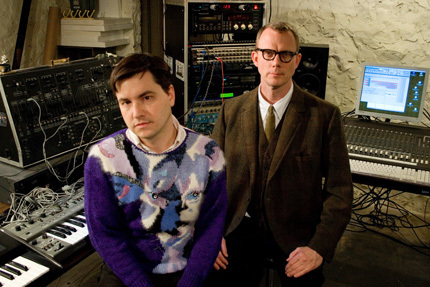 San Francisco’s best dressed men, Matmos, return to Europe this May with Mr J. Lesser in tow. And if you ever wondered what the basement of M.C. Schmidt and Drew Daniel’s Baltimore home looks like, then skip the car commercials and have a look at their Electric Independence. Even though we’d been convinced that all that slaving away at the myriad marketing gimmicks, “promo opportunities” and general suffering we put bands through would leave us with some very exhausted talent, it turns out that these guys just can’t stop doing thangs… read on to see what some of our beloved have been up to. Though she’s on tour with the New Pornographers, as we speak, Kathryn Calder just put the finishing touches on her new solo record. On August 11 the world’ll be treated to ‘Are You My Mother?’ which features an all-star band featuring Neko, Kurt and Todd from The New Pornographers and a handful of other Canadian musical luminaries. Check File Under: Music for more info. Mogwai will be releasing the pretty stunning looking live LP entitled, ‘Special Moves’ to coincide with the release of their first live film ‘Burning’, which was filmed in Brooklyn during the band’s tour in support of ‘The Hawk Is Howling’ in April of 2009. Check Mogwai’s site for info on ordering the record and where you can catch screenings of ‘Burning’. Following the release of their live-film, Dead Meadow released their second live album ‘Three Kings’ and soundtrack to aforementioned film, on the Xemu label in April. Matmos‘ Drew Daniel and Martin Schmitt have teamed up with So Percussion on a collaboration entitled ‘Treasure State‘ — expect to have your mind twisted on July 8. 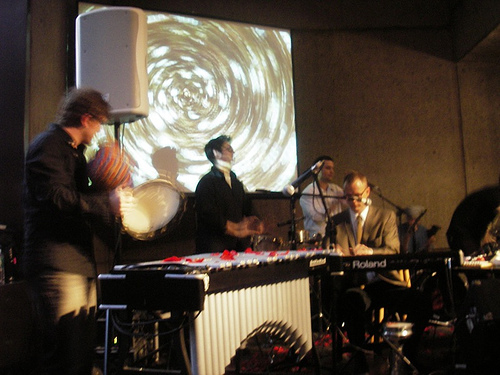 Cantaloupe Records sez: “The record had a complex gestation period: at the invitation of Brett Allen, the members of Matmos and So Percussion went to the SnowGhost Studios in Whitefish, Montana– the Treasure State which gives the album its title– and collaboratively generated the bulk of the songs. 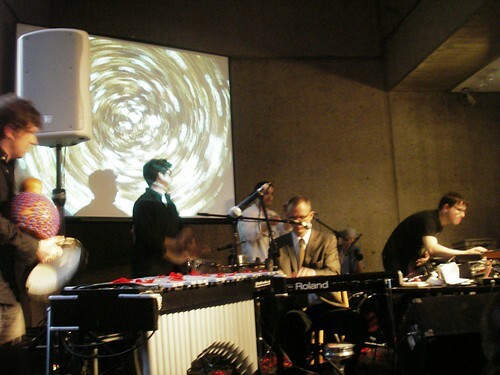 San Francisco plunderphonicist Wobbly then chopped and edited the results on several tracks, and finally, with frequent interventions from Matmos’ M. C. Schmidt, “fifth” So Percussion member and producer Lawson White overdubbed extra elements, processed, and mixed the results.” There’s a handful of live dates, to boot! 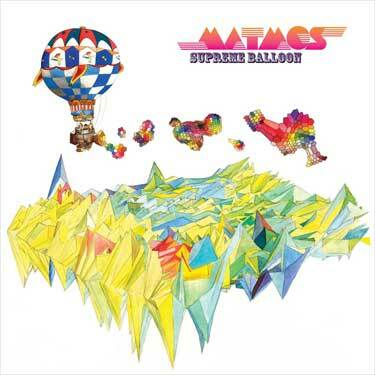 An adventurous collaboration between musical worlds is headlined by one of the giants of the electronic music scene, Matmos, performing with members of the LCO on material from Supreme Balloon arranged by the young composer Anna Meredith. In the hands of pianist Sarah Nicolls, that most familiar of instruments becomes augmented and reinvented for the 21st century, a bespoke contraption pushing at the boundaries of performance. LCO’s first commission of the season comes from Howard Quin and Micromattic, a thrilling audio-visual installation integrating live performance, electronic soundtracks and fractal animation. We (Matmos) are playing quite an unusual show this weekend in the extremely important city of New York at a venue called the Kitchen. We are playing with the So Percussion Quartet and the Princeton Laptop Orchestra-at the same time…it’s really quite an extravaganza of sound, both timbre-wise and spacially. 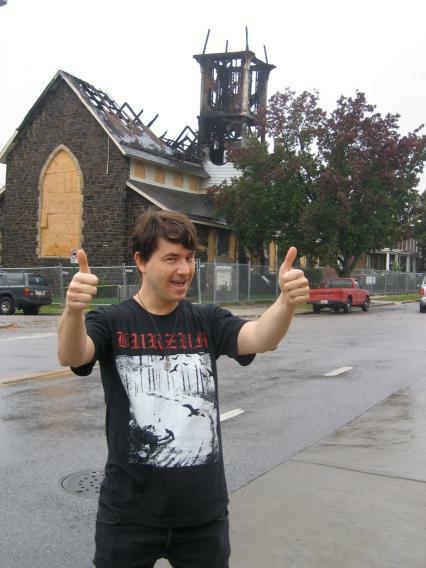 Fans of the Acousmonium take note, this sort of thing doesn’t happen often in the United States. p.s. If you are REALLY in this for the spacial thing, we’re doing this evening again in Princeton itself (considered possibly more pleasant than New York by some) with 25 laptoppists! Count ’em TWENTY FIVE! A month later on May 16th. Princeton University’s Richardson Auditorium. ….but if you were cleaning up all the jpgs on your desktop and happened to come across a photo of Matmos’ Drew Daniel a) wearing a Burzum tee and b) standing in front of what appears to be A BURNED DOWN CHURCH, what would you do? That’s right. You’d post the pic to the Matablog. Enjoy your monday. Matmos’s Drew Daniel will read from his book on Throbbing Gristle (Throbbing Gristle: Twenty Jazz Funk Greats, 33 1/3 Books), answer questions, and do a Soft Pink Truth performance (aka dance party). This is all happening at the Housing Works Bookstore Cafe, Saturday, Nov. 15 at 8pm. Tickets are $10. 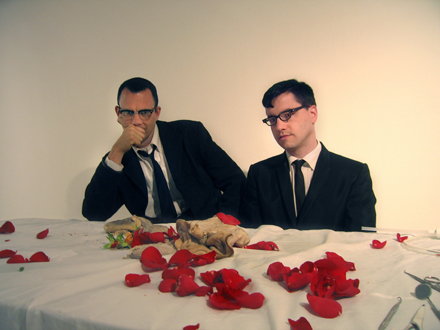 Matmos will present new improvised material tomorrow night (Sept. 6) at The Stone (2nd and Ave. C, New York City) at 8pm and 10pm, joined by special guests Lisle Ellis and Zeena Parkins. Y’know, I used to live on Ave. C and 4th Street and that was a very different neighborhood before Applebee’s, Old Navy and the Cheesecake Factory all set up shop. On the other hand, there’s hardly any chance of walking into a False Prophets gig by accident anymore, so who am I to say progress is a bad thing? 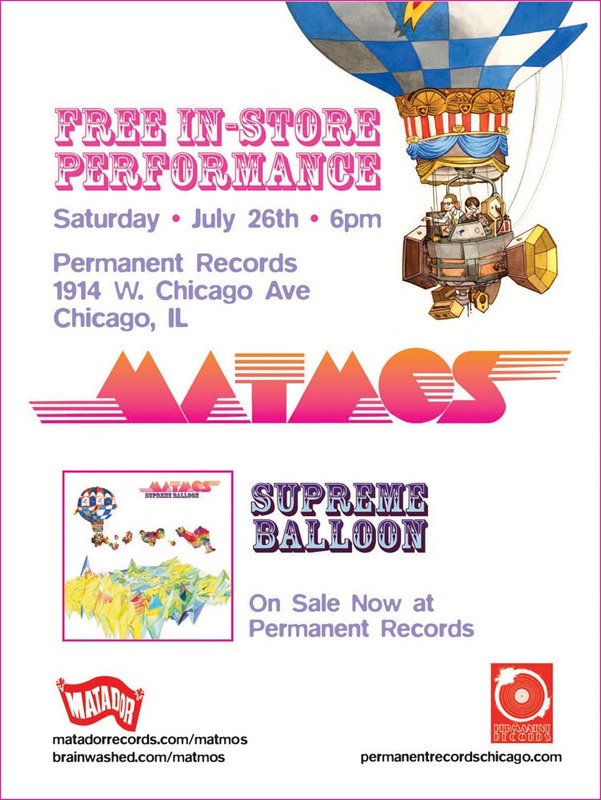 Matmos, currently touring North America in support of their most recent LP/CD, ‘Supreme Balloon’, will be playing at Chicago’s Permanent Records on July 26. We hope you can attend. Not in lieu of the show at the Lakeshore Theatre or anything, but preferably, both. Tomorrow (Friday, July 11) at 11:00 AM (PST), Matmos stop by San Francisco’s KUSF for a live performance on the program “Hearts on Sleeves”. Bay Area residents can catch the program on terrestrial radio at 90.3 FM, while the rest can access a webstream online at www.kusf.org. The NYC venue, LPR, might be more familiar to some of you old timers as the former Village Gate. 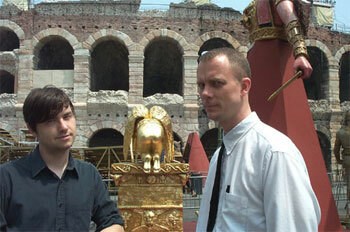 from the upcoming LP/CD ‘Supreme Balloon’ due out May 6, directed by M.C. Schmidt. 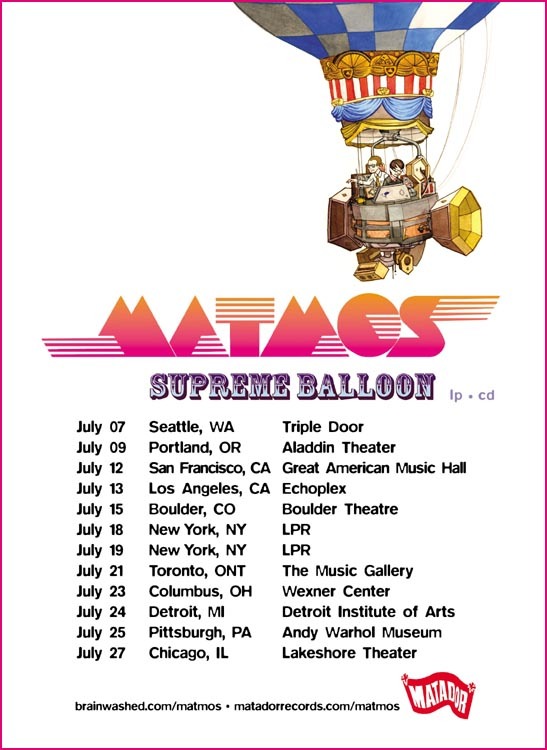 While we’re smack in the middle of planning for the new Matmos LP/CD ‘Supreme Ballon’ (yesterday’s marketing meeting was a doozy — especially the pronounciation debate over “mobile”), Drew and Martin will be in New York this weekend, presenting two shows at The Stone (Avenue C and 2nd Street) on Saturday night at 8 and 10pm. 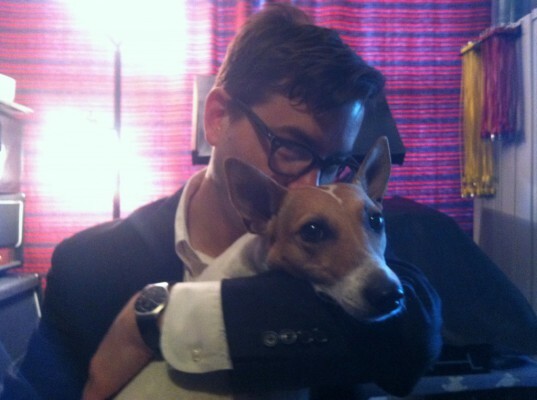 Matmos will be performing their version of Robert Ashley‘s ‘Perfect Lives’ along with additional material. Tickes are $10 (half price for students between the ages of 13 and 19) and are not available in advance. Pardon my mass missive but I wanted to spread the word that I am now a published author. Thanks to the trusty/crusty crew of the Continuum imprint, I now have my own contribution to their 33 1/3 series of books, complete with an ISBN number and a Library of Congress Data tag and everything. 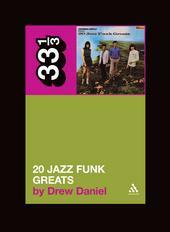 My book is called “Twenty Jazz Funk Greats” and it is about the album of said name by the English band Throbbing Gristle. It weighs in at 176 (teensy) pages. It features original interviews with all four members of Throbbing Gristle, some never-before-published photos and/or drawings from their private notebooks, and lots of interpretive blood sweat and tears from yours truly. Check it out! 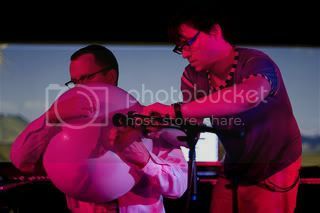 Matmos in London! In July! Yes, the fine men of Matmos will once again grace these shores (England, that is) on July 1st for a date in the Royal Festival Hall with our old pal Cornelius. And obviously, this will be nothing less than MIND-BLOWING.